If you love building and inventions, our hands-on building activities will inspire you! 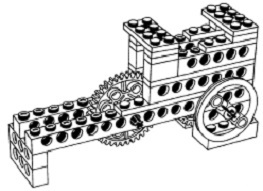 Students working in pairs will work with special Lego gears, levers, and engineering components to build a Drawing Machine, Wall Rocker Racer, Supercharged Speedster, and a Battle Top Spinner. This fun, hands-on class shows students how engineering can be fun and silly, yet still educational. Students will build models and discuss the engineering science behind each model. Students will then be challenged to improve the model and customized their creations.